Being unemployed has led me to do much soul-searching these days. That can be a good thing, or a bad thing, depending on what path I choose to walk down. Most recently, as in the last day or so, I have been considering the journey of my life up to this point. I have discovered that I am my own saboteur. My relationship with my father, for lack of a better word, sucked. He is 80 something, afflicted with Parkinson’s Disease. There is no chance of a relationship at this stage of the game. I was relentlessly bullied throughout my formative years, no one was there to help me. As a result of the above, I never really figured out who, or what I was. I tried to live being what other people though that I should be, using familial, and cultural “norms” to construct a me, that wasn’t really me. Because I constructed a public self, I needed to construct a life that matched. So in desperation to feel “normal”, I added a job, a marriage, a family (whom I love more than life itself), a house in the suburbs and all the other things that signify to the dominant culture that I fit in, that I am just like every other white man living in America. The list goes on, but I think that you understand where I am coming from. After a while, when the “if…only” runs rampant in my thought processes, I shut down. I begin to regret the things I have done and the things that I perceive to have failed to do. And regret gives birth to fear, inaction, self -loathing and paralysis. Then I waste hours, days, weeks in depression and self-pity. Why am I exposing myself like this? Because I cannot live this way anymore. I have come to see that I will do nothing to better my life, my relationships, or my future if I continue on this path. it is the broad road that leads ultimately to destruction. I have been on it too long. I am turning around. I want the road that leads to abundant life. Old habits, they say, die-hard. While that is true, there is hope in that statement that old habit can die. Will you please pray, if you pray (if you don’t pray, send postive thoughts) that i will embrace me, and move forward to become what I have been created to be? Thanks for letting me emote. Good luck! I will pray and send you good vibes. I am in a similar spot in my life. I may be 20 years younger than you, yet I too have a list of what if’s. 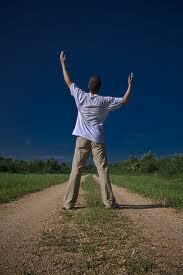 I know that with God on our side everything is possible and I am stepping towards my abundant life. I am sure you to can have life to the full (John 10:10). May God bless you beyond measure. Thanks so much and may he make clear your path as well! You are very welcome. Our God knows what He is doing and I know that He means to bless us with much! Mark, Noone ever is a failure and, perhaps you were unfortunate to have a Father who could not love you but you are loved so much by God and He more than understands all your thoughts and hurts. I, too, have reached a cross roads in my life , my present working place is closing, and, although I talk often to God about what His plans for the future are- silence is all there seems to be. Right at this moment, people are reading your words,thoughts and feelings and many will have experienced such pain themselves – and guess what, Mark – your words help! How can you ever think you have failed, or that your life is useless? Your life, like mine, like many others, is just beginning – our disappointments, hurts and sadness is a stepping stone to something much better , so much brighter – a joy that will have been so very worth the long, long wait. Will be praying .. so keep trusting – the sun will shine! Thank you for your prayers, and my prayer for you is for clear vision for your future. Through all the turmoil, and uncertainty, I cling to only Him. He is the only constant in my life. Thank you too for reminding that God does use me to minister to others as well. We all live in the only if prison. Praying we all find the freedom Christ has for us. I have been in precisely the same position–I mean down to the father and the bullying–I share that because I want you to know that you aren’t the only one who feels that way. Brother, you want things to be different. I’m on board with that and the responsibility you must be feeling for your family as you struggle through this difficult time must be really difficult. But if I say to you, things are already different, you just have to shift your perspective a bit, would you believe me? There is no switching paths. You just need to walk on the one where your feet are and not look so longingly at the imaginary path you thought you would follow once you conformed and got things right. I’m telling you my brother, God put the compassion and the words in you and you let them flow. Is there any wonder why there is opposition? Just as young David looked around at his fellow Jews with incredulity as they cowered in the face of Goliath, you look at your situation, your Goliath and your choice is to either cower or to run head long into battle with just a slingshot. David looked at his brothers and could not believe how afraid they were…given who God is. He ran into battle not trusting in his slingshot but in assurance that this beast was challenging God more than he was challenging a few thousand Jewish guys who probably just wanted to go home. Let me tell you that those voices, the “if only” ones, are like a stupid giant taunting you. Nyah nyah nyah! They loom large, don’t they? The greater they will fall and you will chop off their heads to display to all! Yes, I had a rough relationship with my father. Yes, I was bullied and taunted virtually every day of my life for all of my school years. But see what God has done! And He has done it despite the fact that I don’t fit the mold that other Christians have prescribed. You know, you have way too much passion and compassion to be a mere christian–the kind we see today, (I intentionally use the small c.) You are a voice crying in the wilderness. On many occasions, I’ve read you calling small-c christians to become big C-Christians that they might learn to love the way God loves, for real. Are you surprised by opposition? Now instead of those other voices, hear mine. Stand-up and fight. So they got a few punches through your defenses. Yes but you are still standing. You aren’t dead. You aren’t laying on the mat. Silence the past. Ignore those people who say that you are where you are because God has abandoned you. God has not abandoned you. Declare the truth. Is not God, God? Then, like David, declare it. God is God. Yes, I’ll pray for you. Certainly, I will. Lord, by your glory and grace, give my brother the balls of David that he may stand tall and strong in your power and in your authority. By my prayers, I join him in battle knowing that you are who you are and that your will shall be done on earth as it is in heaven. Oh, father, let us see heaven. Let us see your works that we might move in confidence of your strength. Thank you for creating him to be the amazing man of God I’ve seen through his written words of love and show him your power and your grace. Fill him father with your love that flows. Open the floodgates of love in his life and allow him to move into your provision. Thank you. Great is your grace and your mercy. May my brother be comforted in his trials and may he be strengthened in battle. These things I pray in the wonderful name of Jesus. Amen! Thank you so much. You always say the right thing, and your words always bring me to tears. There are things I need to do, things that will move me forward in this life. That can only happen and will happen, as with David, through the power of God in me. Some of those things will be painful, but ignoring them, and remaining fearful of the perceived outcome, cannot remain an option of me. Your encouragement, and your challenge, has inspired me. Thank you so much for writing this. This response is written in tears because I have liveed my life exactly the same way. I have been out of work now for a year and a half and feel like I have fallen down a rabbit hole. If loosing my job wasn’t enough I was already dealing with my parents and my Mother in law passing away in the last 3 years. It very weird how you begin to loose confidence in yourself while being unemployed. My spouse who has a very secure and well paying job doesn’t seem to be able to relate to any of what I’m going through. So since high school I have worked full time, now I’m 50 and feel like my life is now being defined by just my unemployment. So the point is your not alone and we are all going through the same feelings. We all need to shake this off. Your writing has made me stop and think and identify my self destructive thoughts. I am sorry to hear of your stuggles. I pray for you. I can not really offer words of wisdom in dealing with unemployment without sounding hypocritical. I struggle, and question, and feel fro time to time as though i have failed at life. There is much that I have not spoken uotright about here, but trust me, sometimes the self condemnation and sense of worthlessness can overwhelm. it is specifically at those points I lean most heavily on the unconditional loving arms of God and His grace. He sustains me, He will sustain you too.